The Pahrump Valley Trojans football team hosted Desert Pines, last year’s state champions, in league action, losing 28-0. 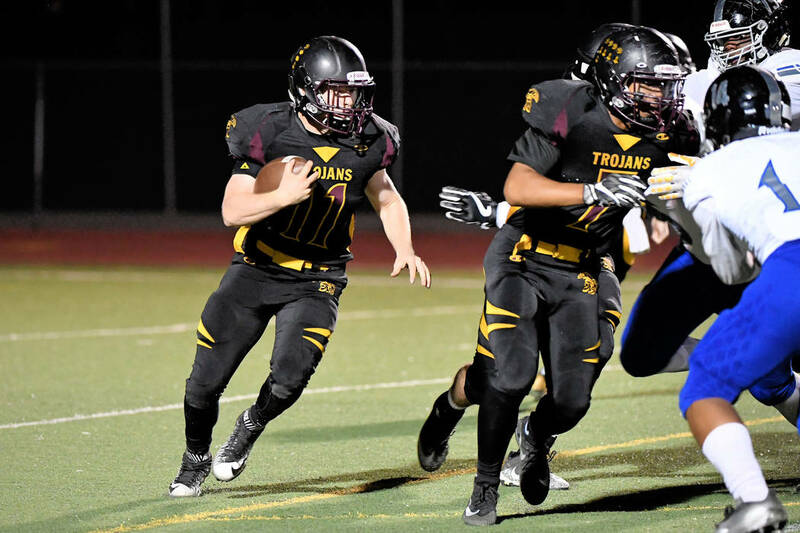 Junior Trojans running back Nico Velazquez runs with the ball against Desert Pines last Friday. The Trojans were able to run against the defending state champions. Peter Davis/Special to the Pahrump Valley Times Jeremy Albertson and his fellow defensive linemen were able to pressure the Desert Pines quarterback all night long, resulting in several sacks. At left, Junior Trojans running back DeAngelo Brown runs the ball downfield against the visiting Jaguars last Friday. 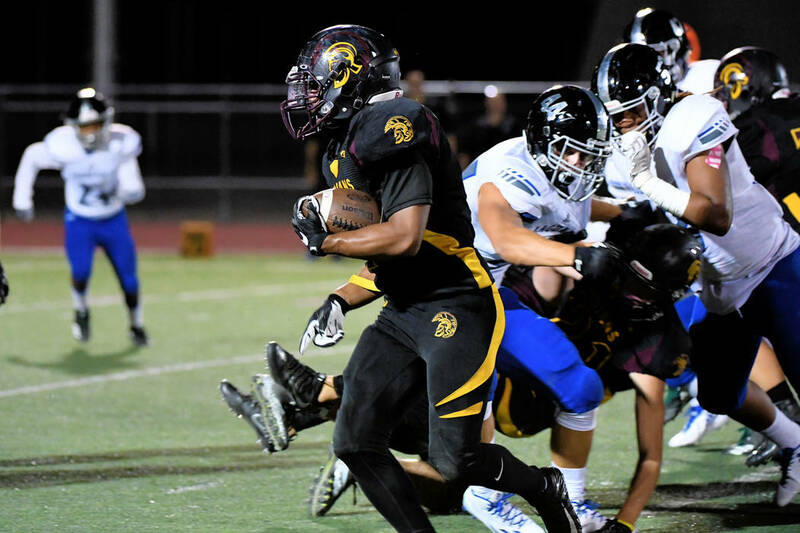 Brown had several long runs and the Trojans were able to run up the middle against Desert Pines. 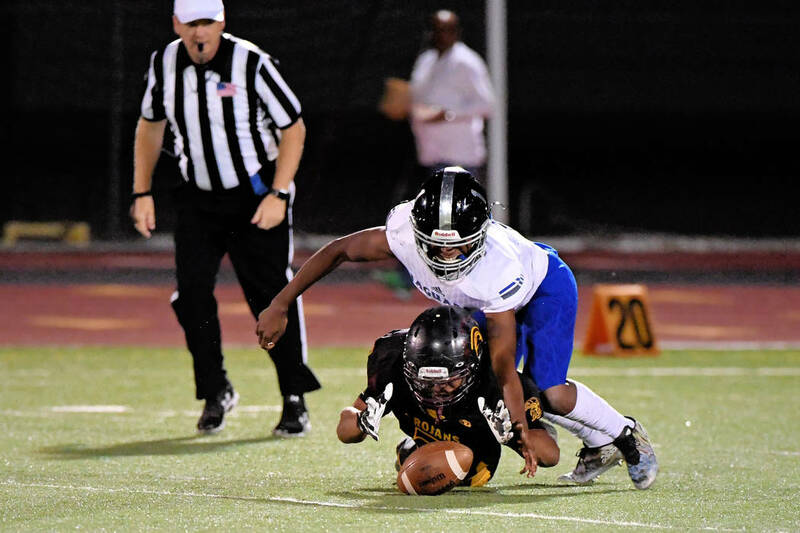 Peter Davis/Special to the Pahrump Valley Times DeAngelo Brown recovers a fumble during the Desert Pines game. The Jaguars made numerous mistakes and had numerous penalties, but the Trojans failed to capitalize on them. Peter Davis/Special to the Pahrump Valley Times Senior Trojans running back, David Roundy, rounds the corner last Friday against Desert Pines. Peter Davis/Special to the Pahrump Valley Times Senior defensive back, Cory Bergan, tackles a Jaguar last Friday. 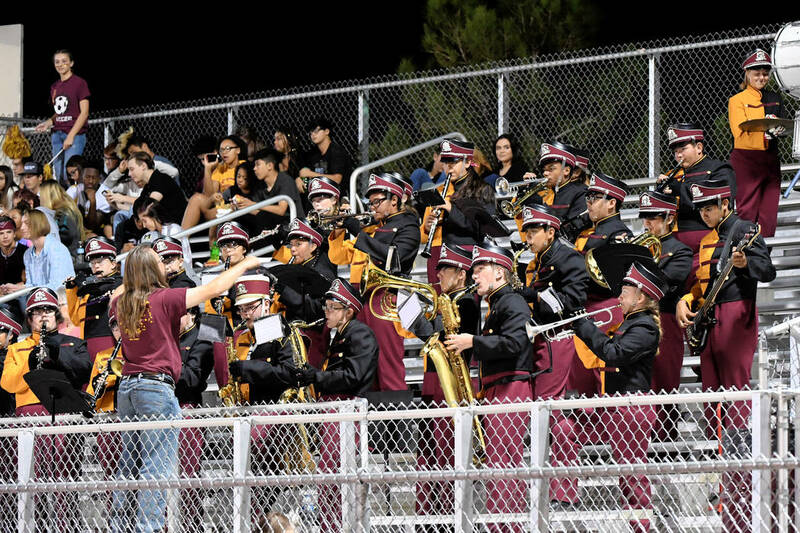 Peter Davis/Special to the Pahrump Valley Times The Trojans marching band showed off their new uniforms at last week’s home game. 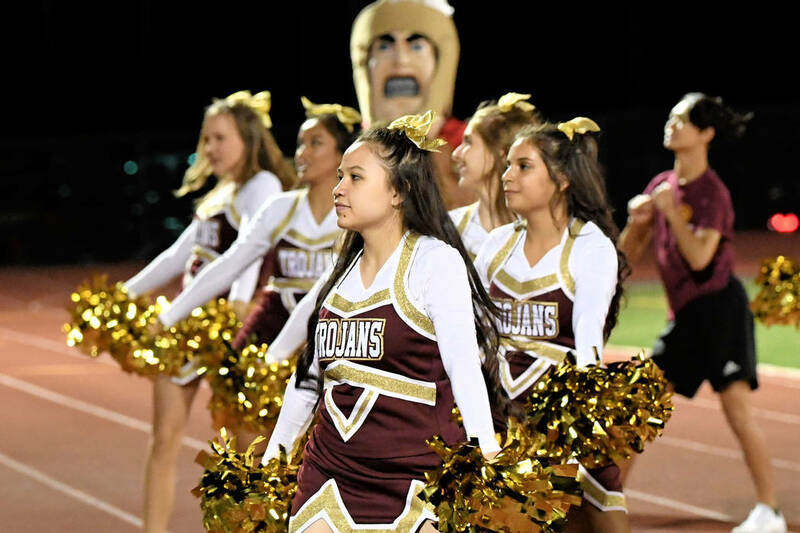 Peter Davis/Special to the Pahrump Valley Times Pahrump Valley’s cheer squad cheers on the Trojans football team during last week’s home game against Desert Pines. But the Friday night game was not so cut and dried and can be looked at as successful through positive eyes. 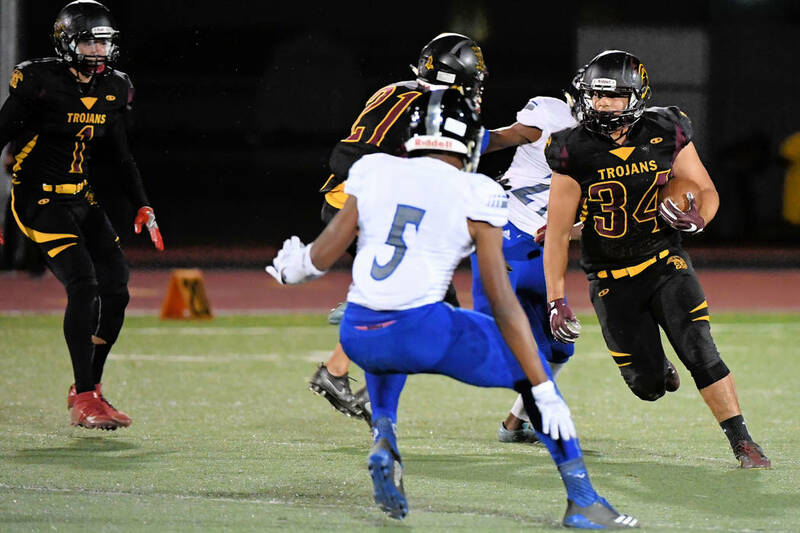 The Trojans offense showed they could hold their own in the first half against the defending state champions and the Trojans defense was able to stop Desert Pines and put pressure on their quarterback. 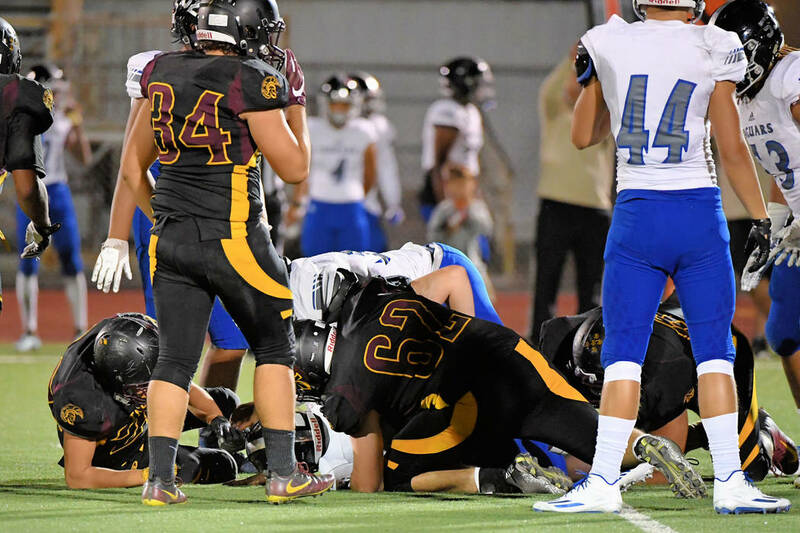 In the first and third series for Desert Pines, in the first quarter, Pahrump’s defense was able to stop the Jaguars’ offense, forcing a fumble in the first series and with a sack in the third. After a failed first offensive series, the Trojans defense recovered a fumble early on in the first quarter. Pahrump then ate up the clock and showed Desert Pines that they could run against their defense. The Trojans took the ball into the red zone but failed to score. They held on to the ball for nearly 10 minutes. Desert Pines got the ball late in the second quarter and scored the only touchdown of the half and took a 7-0 lead into halftime. This was still a huge boost for the Trojans, last year at the half the Jaguars led 42-0. The Trojans had one more good drive, which was late in the third quarter with 6:36 left and the score was 14-0. Pahrump took over the ball on their 11-yard line and then marched down to the Jaguars 28, but on third and 10 a Coffman pass was intercepted at the Desert Pines 10-yard line. In the end, to win games a team has to score and Desert Pines did that while Pahrump was unable to put the ball into the end zone. The Jaguars could have won the game 50-0 but were hampered by too many mistakes and costly penalties. 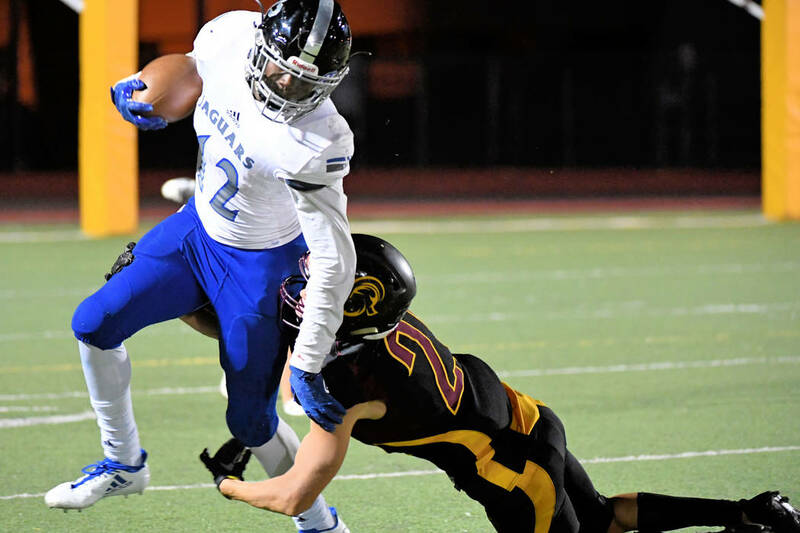 The Trojans failed to capitalize on those errors and could not stop the speed of Desert Pines running backs who were able to run both inside and outside against Pahrump’s defense. Trojans (2-3 overall, 0-1 Sunset League) host Cheyenne (2-2, 1-0) on Friday at 7 p.m. in league action.